Great post! This is exactly the kind of analysis that is so helpful. It gets to the heart of government websites. Well done. It is important to note that this is just one user's experience and therefore not an objective task analysis of the site. When attempting to complete the first task (new drivers license), I had no such issues. Residents (top navigation) > Cars & Transportation > Driver License Division > FAQ > What do I need for a first-time driver license? but does that mean anything? Is my A "really" better than your C? No, not really. I haven't tried the other tasks yet, but I just wanted to make the point that no plan can account for how everyone thinks, we can only do the best we can overall. I do think that these are good tasks to try -- with multiple users to observe trends and make improvements. All web sites should be doing this continuously all the time. A web site is never done improving. Great comments @anonymous. Usability is both personal and general. See also Jakob Nielse's research on getting good usability research results with a small sample size. 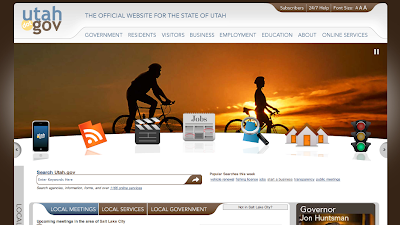 I'd add that it could be that the tasks that I identified as important to me are not optimized because they are not important to most utah.gov visitors. Maybe their data showed that getting a new license is unimportant. You can't be everything to everyone and a strong focus is critical to successful web design. Transforming Online Government" for this and other recommendations on improving government websites.) A portal brings the sites together, but cannot make them make sense together. Thanks again for sharing your thoughts. Your reminder that I am not "normal" is truer than you know [/endjokeonself]. @candi Thanks! The work is just a reminder that this stuff isn't as easy as it looks! @Bob, sorry, there was a squirrely delay with getting your comment posted. Thanks so much for your comment. You guys are doing GREAT work.